Wildflowers filled Death Valley for about two months during the recent super bloom event. It was the best bloom in several years. Photo: National Park Service. You may have heard about the Death Valley super bloom earlier this March from the abundance of photo essays on the Internet. In case you missed it, the super bloom is a period of rapid flower growth in Death Valley, one of the hottest, driest deserts in the world, where plant life is normally sparse. During super blooms, there are flowers everywhere. Although by mid-March many of the plants are already fading away in the lower parts of the valley the can still be found at higher elevations. Super blooms are rare, the last one was in 2005, and they’re caused by the El Niño effect. During these periods Death Valley gets far more water than normal. All deserts get some rain, and Death Valley is no different, usually netting about around 2 inches each year. But in late 2015, huge amounts of rain fell in the valley, causing flash floods that put several roads out of commission. Much of that water seeped into the ground, where it allowed dormant seeds to grow, resulting in massive wildflower blooms. The flowers rest in the dry soil of Death Valley for years at a time, waiting for events like these rainstorms. Combined with the subsequent mild weather of winter, these seeds were able to sprout and quickly grow. They then produce seeds before the temperatures get to high again, allowing those seeds to lie dormant until the next heavy rain season. 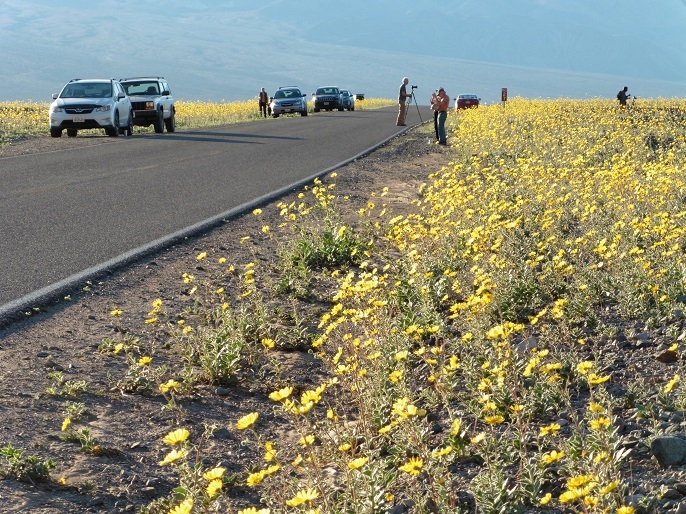 Twenty species of wildflower were on display in Death Valley for about two months, including the Desert Gold, with bright yellow, daisy like flowers that, this year at least, reached waist height in some places. It’s a pretty potent reminder that nature is generally far more varied and resourceful than we give it credit for, and even in a place like Death Valley, life finds a way. Previous postThirsty Yet? Climate Change is Drying Up Your Drinking Water!